Hi everyone! I wanted to take a second to write about something other than crafts or watercolors or crochet. All good things, yes. But there's more to life than that right? Today I had the chance to see the new "Meet the Mormons" movie in the theater. The first time in years I actually went to a full priced normal theater! It was good. The movie exceeded my expectations and not just because I happen to also be a Mormon. It was really uplifting. It made me want to do more and be more. It gave me a new perspective on my own religion. Mormons don't just live in Utah. They are all over the world. They don't just hide out in their homes, totally secluded and sheltered from the world. We live in the world and have many of the same concerns and struggles that other people have. What struck me the most about the movie was how happy the people were. 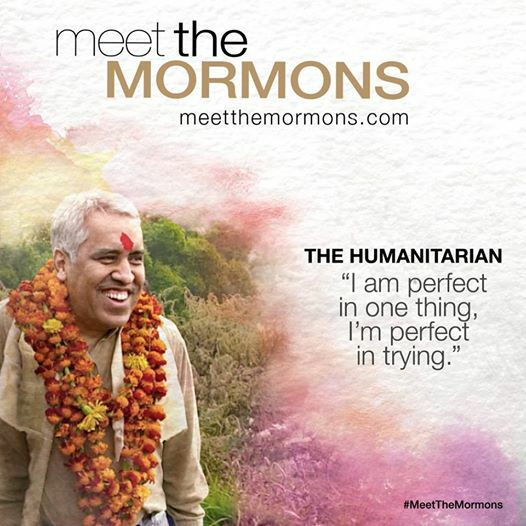 The movie focuses on six different Mormons in different parts of the world doing different things. Their lives were not perfect. One mother came from an extremely difficult background, but there she was with love and joy in her life. I cried. I smiled. I left feeling good. This was my favorite quote! Go check out the trailer for the movie!